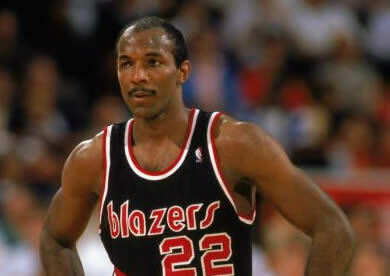 Clyde “The Glide” Drexler played in the NBA from 1983 to 1998, mostly for the Portland Trailblazers, as well as a few years with the Houston Rockets to round out his career. He won a championship with the Rockets in 1995, but it really doesn’t count since Jordan took that year off to play baseball and gamble. Clyde was a ten-time All-Star and member of the Basketball Hall of Fame, the NBA named him one of basketball’s fifty greatest players as of 1996. He was part of the 1992 USA Basketball “Dream Team.” I watched the documentary on said team last night and believe you me, there are more steeshes to come from that film. This entry was posted in Sports Steesh and tagged basketball, basketball dream, basketball hall of fame, Clyde Drexler, clyde the glide drexler, dream team, hall of fame, Houston Rockets, Humor, Moustache, mustache, nba, Portland Trailblazer, portland trailblazers, sports, usa basketball, USA men's basketball on June 19, 2012 by Los Bulls.